It was nearly a year and a half ago that 2D Boy announced that their critically acclaimed indie title World of Goo would be coming to the iPhone. After more than a year of waiting, Word of Goo finally did hit the App Store, but for the iPad rather than the iPhone or iPod touch. The game was absolutely fantastic on the iPad though, earning 5 stars in our review and garnering our iPad Game of the Year award for 2010. World of Goo was a great success on the iPad too, but despite this 2D Boy still wasn’t sure that the game would ever reach its originally intended platform of the iPhone. 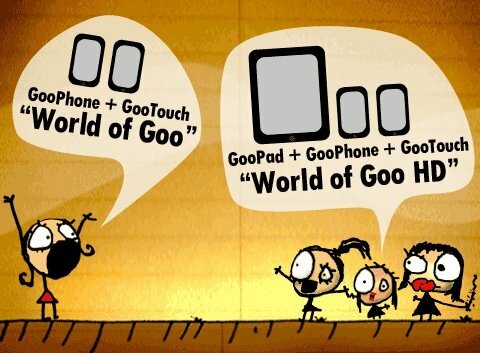 In late February, 2D Boy confirmed that World of Goo was indeed officially coming to the iPhone and iPod touch. Today this long-awaited version of World of Goo is finally available in the App Store at a special introductory price of 99¢ for the first 24 hours. What’s more is that owners of the iPad version World of Goo HD will get a free update that makes the game universal, so if you own an iPhone or iPod touch you’ll already be able to play it on those devices in addition to your iPad. One thing to note is that World of Goo requires a 3rd generation device or higher, so make sure you have the proper equipment to handle the game before downloading. Both versions of the game are supposed to support Retina Display devices, but due to an apparent bug it currently does not. 2D Boy is looking into the issue and will issue a fix to the problem as soon as possible. Also, after the introductory price of 99¢, the game will jump up to its regular price of $2.99, with the universal HD version staying priced at $4.99. 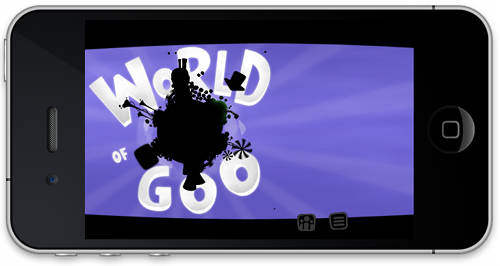 Despite the smaller screen of the iPhone and iPod touch, World of Goo still plays wonderfully and contains all the same content that appeared on the iPad last December. The biggest difference is that you can pinch to zoom on the iPhone version, which can be helpful in certain situations. Players in our forums are really enjoying World of Goo on the iPhone and iPod touch, and if you’ve ever been interested in the game but didn’t own an iPad then now is the time to get in on the fun.